Aquantia got a lot of positive publicity this year with its relatively inexpensive 5G and 10G network cards, which brought multi-gigabit Ethernet down to around $100, making them some two-to-three times cheaper than earlier NICs. On Black Friday, the company is going to slash prices of its cards even further to $59 – $69 per unit, making these the cheapest multi-gigabit NICs to date. 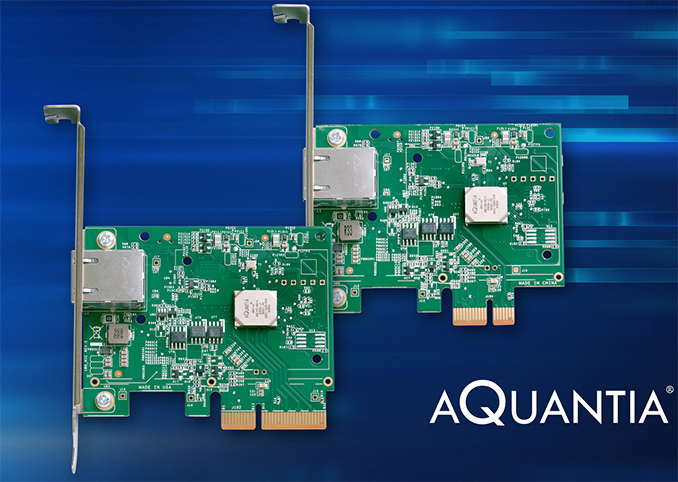 Aquantia’s AQN-107 and AQN-108 network cards are based on the company’s AQC107 (10 GbE) and AQC108 (5 GbE) multi-gigabit network controllers. The more affordable AQN-108 card uses a PCIe 3.0 x1 interface and supports various BASE-T standards, including 100M, 1G, 2.5G and 5G over an RJ45 connector using Cat5e/Cat6 cabling. The more advanced AQN-107 card features a PCIe 3.0 x4 interface and supports all of the aforementioned standards as well as 10G. The cards are compatible with various contemporary and legacy PCs running Windows 7/8/10 or Linux 3.2/3.6/4.2/4.4. On Black Friday, November 24, the Aquantia AQtion AQN-108 5G NIC will be sold for $59, down from its regular price of $99. The AQtion AQN-107 10G NIC will be available for an $69, down from $127 regularly. This promotion is only going to work with Aquantia’s international distributors — Arrow, WPGA and WPI, but not regular retailers (see direct links to the cards on websites of the said companies in the table below). It is not unusual for various companies to sell their products at bargain prices on Black Friday, however such a deep discount on a recently launched product is a bit more atypical. Keeping in mind that the AQN-107 and AQN-108 network cards were released only several months ago and are up to date (and you do not expect NIC developers to introduce new models every year), it is clear that $59 – $69 per unit are price points that Aquantia is comfortable with, and that this isn't a Black Friday close-out sale. It's probably a bit premature to make predictions regarding future retail prices of Aquantia-based multi-gigabit network adapters from partners like ASUS and GIGABYTE (who want to earn on their products), but it is safe to say that the multi-gig cards can get cheaper than they are now. While multi-gigabit Ethernet cards for $59 – $69 look very affordable (by today’s standards), multi-gigabit switches still remain rather expensive. We have been monitoring pricing and availability of 10 GbE-supporting switches at leading U.S. retailers for several months now and it turns out that the least expensive model is still the ASUS XG-U2008 10GBase-T (two 10 GbE ports, eight GbE connectors) that is available for $220 from Amazon and Newegg. Perhaps, Black Friday will bring some sweeter deals. It will work with the proper adapters, although that will increase the price significantly. At least like 20$ a pop.